Forms a permanent waterproofing air/vapor seal around curved and radius doors and windows that prevents air and moisture leaks. 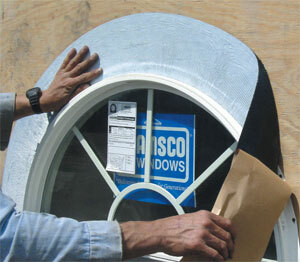 Protecto Flex® is a 90-mil thick peel and stick flashing tape. The flexible cross-laminated top surface will expand and conform to irregular or curved surfaces while the aggressive adhesive forms a permanent bond between the window fin and the building substrate. Protecto Flex gives you a total air and water seal without having to cut and patch in the membrane to conform to irregular or curved window and door openings. Protecto Wrap waterproofing products meet or exceed waterproofing properties of sheet membranes or liquid coatings for almost any job such as floor, tile and roof underlayments, window and roof flashing and others.